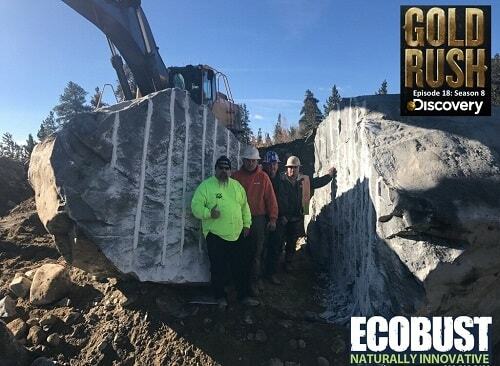 A recent episode of Discovery Channel’s Gold Rush, has highlighted the effectiveness of Ecobust in controlled demolition. One of the project teams on the show came to a grinding halt when their digger hit a boulder they named King Kong. They had no permit or licence to blast and their machinery didn’t have the capability to remove or break the boulder, so things looked impossible for the crew. Luckily one of the team had a couple of cartons of Ecobust with him. The team simply drilled the holes, poured the mixture into the holes and left the product to do the work for them overnight. The next morning they were amazed at the result. Ecobust works as an expansive agent, exerting over 20,000 PSI during expansion and increasing to 4x its original size. This makes it ideal for controlled demolition in areas where blasting is not an option, or where a more controlled process is required. To find out more about Ecobust and suitable applications, contact Neoferma on the form below.